The men’s and women’s cross country teams advanced to the state meet after last Thursday at the Marshalltown district meet. The men qualified for the State meet by winning the Marshalltown District. They had four runners in the top 10 and all seven runners in the top 18. The women took second at Marshalltown also qualifying for the State meet falling just short to Dowling Catholic with 5 runners in the top 10. “Districts went really well for us. We went up against the No. 4 ranked Dowling and beat them by six points to become district champs. We would have liked to beat them by more, but if we run to our potential we should not have a problem beating them by a lot more than six once stat comes around,” said junior Adam Streicher, who finished second overall for men’s districts. “We’re gonna approach State like we would approach most other meets. We’re on the end of our taper, which is where we decrease our distance to make sure we run our best. There isn’t much for us to do now to improve our team for State. Basically, what we do from here on out is believe in the taper and in our training. Then we need to go out and run our best. If someone beats us while we run our best, then they deserve it and we’ll shake their hand, but they’re gonna have to run fast,” Streicher said. “Districts were good. Dowling is a very good team, so placing second behind them is good because they’re ranked very high. We all need to run our best and our third fourth and fifth runners need to stay together and come in together to maximize our point total. I think the team will do very well (at State), and we’re hoping to place in the top five. I want to PR (personal record), and have a good time but as a team goal we want to beat Iowa City West,” said sophomore Allison Gregg who placed third individually for the women. Other runners for the men’s cross country are Jaime Zarate who placed fourth, Andrew Halloran who placed seventh, Matthew Adrian who placed 10th and Mitch Hammer who placed 12th. Other runners for the women’s cross country are Brianna King who placed seventh, Cassy Herkelman who placed eighth, Hannah Savage who placed ninth, Cara Strike who placed 10th, Kate Halloran who placed 17th and Kaitlyn Hennings who placed 20th overall. 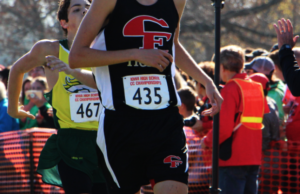 The state meet will be held in Fort Dodge on Saturday, Oct. 30 at Lakeside Municipal Golf Course where the 4A women will run first at 11 a.m. and the 4A men will follow at 11:30 a.m.